Last year around this time, I wrote about Stephane Dion’s reward to the top-tier of elite Liberal donors. Last June, the Liberal leader held an exclusive garden party at his official residence, Stornoway. The mansion is property of the National Capital Commission (NCC), a division of the federal government, and therefore public property. 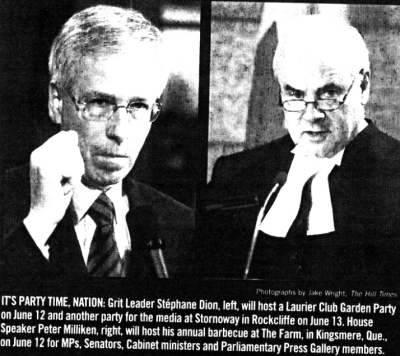 This year, Stephane Dion is again using Stornoway to reward members of the Laurier Club for paying their dues to the party. If you’re a loyal Liberal and have maxed out your annual donation at $1100, you can hob-nob it with fellow Liberals of equal or greater means at the residence currently on loan to Dion by the Canadian taxpayer. Not a Liberal donor but just a chump who pays their taxes? Sorry, this party is for VIP Liberals only. I still have the same question. Liberal leader Stéphane Dion is hosting several hundred of the party’s well-heeled donors tonight at an exclusive garden party in his official residence, Stornoway. Between 400 and 500 members of the Laurier Club, membership that comes only with an annual donation of $1,100 to the Liberal party, are expected to gather under a sprawling backyard tent as part of Mr. Dion’s garden-party events this year, an aide confirmed. Laurier Club members did not have to donate to the party to attend the event in their honour, press aide Mark Dunn said. An entrance fee would have been handy, in light of Mr. Dion’s outstanding debt from his 2006 leadership campaign, but contrary to political financing rules. In 2006, Parliament passed the Harper government’s public accountability act in 2006, lowering the ceiling on individual donations from $5,000 to $1,100. Last night, members of the Liberal Party’s elite “Laurier Club” assembled at the residence of the Leader of the Official Opposition. The venue was the Stornoway mansion and the event was a garden party. First, what is the Laurier Club? The Laurier Club is a national organization made up of business executives, community leaders and those interested in sustaining the Liberal Party who also support the principles of parliamentary democracy and are interested in the public policy decisions affecting the lives of the citizens of Canada. Individual membership contribution is $1000 and is in good standing for a period of twelve months starting on the sign up date. Membership does not include contributions made to local ridings, candidates, leadership and nomination contestants. Members can choose to make a one time gift or sign up for monthly contributions. Stornoway is the property of the National Capital Commission (ie. the government). It’s not illegal to use government property in this way as a perk for top donors to a political party per se, but is it ethical? The Prime Minister does not assemble top donors for parties or hold fundraisers for the Conservative Fund at 24 Sussex. However, former Liberal leaders Bill Graham, Paul Martin and Jean Chretien have used Stornoway and 24 Sussex to fête top Liberal Party donors in the past.